Standard three bolt bracket machined and fabricated, it will be a direct bolt up to your existing axle tube end flange. You get both brackets and six grade 8 bolts and zinc plated lock washers. 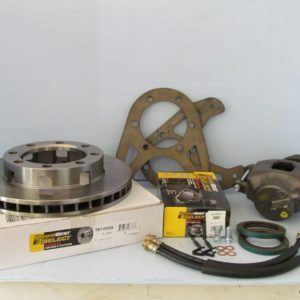 We do NOT supply the rotors, loaded calipers (constitutes: calipers, pads and slide pins) or the flex hoses (you must run flex hoses with this kit and adapt to your hard line). 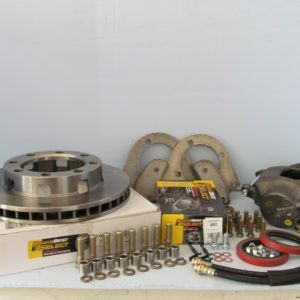 All of these components should be acquired from the front end of a mid 1970’s GM 3/4 ton 4×4 pickup., your local Napa will be able to acquire these for you or any other reputable dealer such as Rock Auto. 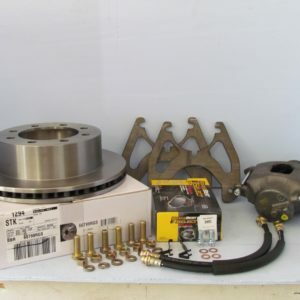 If you need actual part numbers for these parts I can provide them. 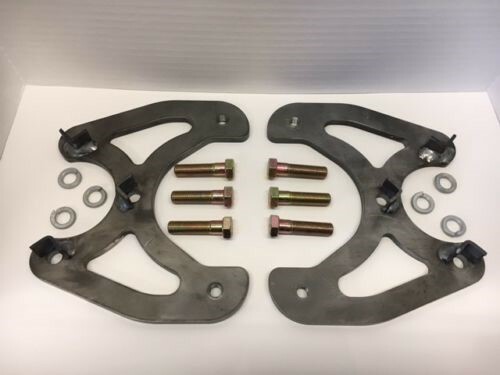 These disc brake brackets will accept the common 1976-1978 Cadillac Eldorado rear calipers that have a built in mechanical actuated E-brake should you need them. We have the actuation brackets and springs available in another kit for sale independently should you go that route. Please ask if questions, just give me a call I’m here to help.